She will get very good at requesting for her basic needs and wants with words, but then she is going to plateau with the different ways that she can use her language because she will not have a desire to speak about anything else! I have come across so many kids with autism and asperger’s syndrome over the past 12 years where the parents have been desperate for the child to start talking and then have been so disappointed that when they finally start talking that it does not amount to much!! Because of this I am training Sasha’s parents to really work on improving Sasha’s play skills. They’re also following the tips in my audio “7 Steps to Unlocking Your Child’s Social Skills‘. In our therapy sessions I remind them that whilst we are working on increasing the number of words that Sasha can say, it is really vital that we keep expanding her world and interests so that she will not be one of those kids who’s language plateaus out shortly after they start talking. The key to doing this successfully is by taking small steps and introducing new things very gradually so you don’t overwhelm them. You want to help them see the value in trying new things. The trick is to take something they’re familiar with that motivates them and combine it with something else that they like. The first obvious step is that you need to know what they like and what already motivates them. This will make your job much, much easier. So the next time they’re jumping on the trampoline… rather than simply jumping, try singing a song or blowing some bubbles whilst they are jumping, or put a few small balls on the trampoline and watch them bounce everywhere as they jump! You could even try just adding one ball at first, then adding more as they adjust to the new experience. 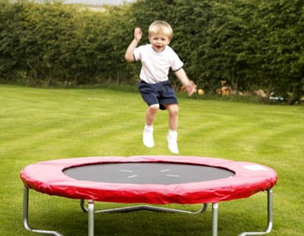 By introducing new things in this way they can focus on the new experience (the songs, bubbles or balls) while being comforted by the familiar and motivating sensation of jumping on the trampoline. This technique can be applied to just about anything your child likes to do. You’re only limited by your imagination! If it’s obvious that your child is not enjoying a new experience, go back to what they like and then try again later or try another idea. Using this technique will gradually expand your child’s world over time, and it will really encourage their expressive communication because they will have so many more things that they really want to share with you! How does your child cope with new experiences? Have you tried any particular strategies? How well did they work?? P.S: If you’d like to share this article with anyone who may enjoy reading it, you can click on the ‘Share’ button directly below, then simply follow the instructions on the next page.